Police officers lead several protesters away from Flake's office Friday after the Senate cloture vote. Two demonstrators console each other while standing outside the office of Sen. Jeff Flake, R-Ariz. Protesters gather outside Flake's office, not long after the Republican voted to advance Brett Kavanaugh's nomination. Flake's was not the only office visited by demonstrators Friday. Other senators who had been considered on the fence also saw last-minute lobbying. Police lead a demonstrator out of the building. Outside the chamber, meanwhile, a much louder kind of drama has been unfolding — much of it aimed at the few senators who remained undecided. Before Sens. 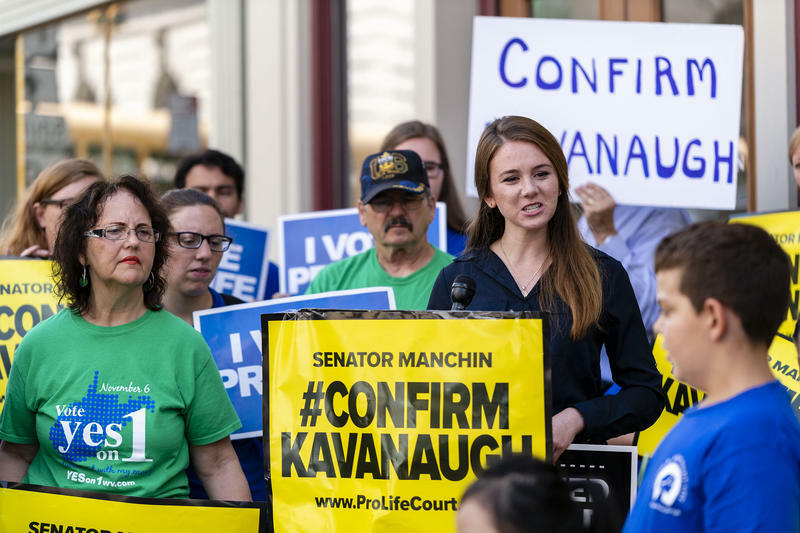 Susan Collins, R-Maine, and Joe Manchin, D-W.Va., announced their support for Kavanaugh's confirmation on Friday afternoon, protesters launched a last-ditch campaign to persuade the senators to vote no. With Collins and Manchin publicly on board, Kavanaugh had the votes Friday evening to be confirmed to the high court. A final vote is expected over the weekend. 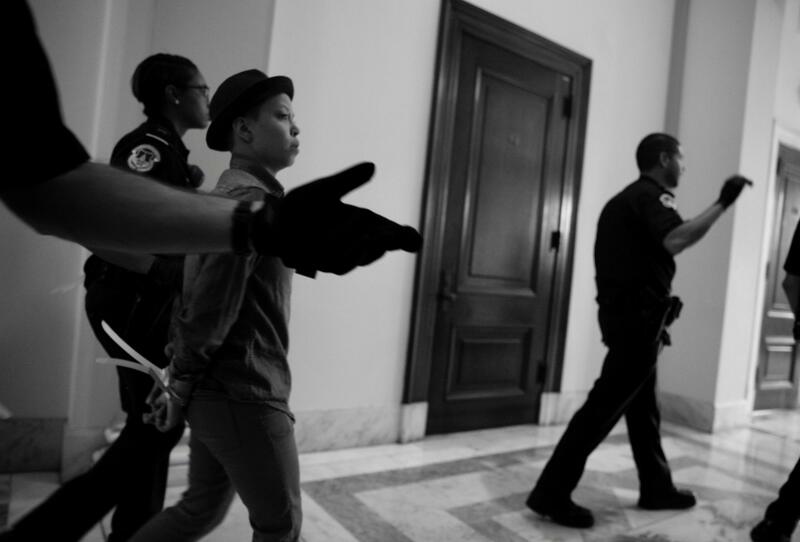 The protesters' campaign came just a day after an hours-long demonstration ended in hundreds of arrests. 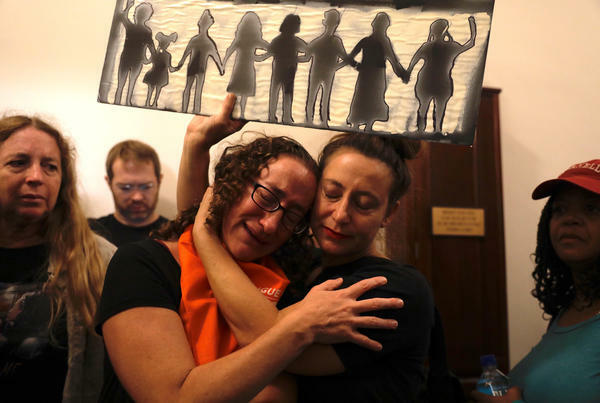 By the time Friday morning arrived, barricades had been erected around the Capitol building, but that did little to dissuade some determined demonstrators from hefting signs and raising their voices against Kavanaugh's bid to replace retired Justice Anthony Kennedy. Kavanaugh's confirmation would likely swing the court rightward in its judicial leanings — but that's not what protesters have been most concerned with Friday. They're focused on the allegations against Kavanaugh of sexual misconduct in the 1980s. In his testimony before the Senate Judiciary Committee last week, the federal appeals court judge flatly denied Christine Blasey Ford's assertion that he sexually assaulted her while they were both in high school. The FBI provided a confidential report to senators on Thursday after a limited inquiry into allegations of misconduct. Republicans said the new interviews offered no corroboration of Ford's claim and said Kavanaugh had been thoroughly vetted. Democrats, for their part, decried the probe as woefully narrow in scope. Many of the demonstrators around Capitol Hill are not satisfied either, and they got an early start Friday explaining why. "These are credible allegations. And when he was responding to them [during his testimony last week], he still has to behave — and should behave — with the comportment of an officer of the court and someone who can be respectful," Rachel Cella, an attorney who flew in from Alaska, told NPR. "And that's not what we saw from him. I would be troubled to have to appear before him as an advocate." Cella had joined one of many small, scattered groups of demonstrators who had assembled outside the Supreme Court building just before the Senate cloture vote on Friday morning. While their numbers were dwarfed by the rally the day before — in which thousands showed up to march and lobby their senators personally — Cella said their determination remained steady. Few of those lawmakers have held more importance than Cella's own senator, Alaska's Lisa Murkowski. The moderate Republican put forward a surprise "no" vote on cloture for Kavanaugh on Friday, moving to block his advance just a day after dozens of Alaskan voters flowed into her office to speak with her. More than 100 Alaskan women had made the trip in hopes they could sway such a pivotal vote. And it may have made a difference: The senator told NBC News she did not make her final decision "until walking into the floor this morning." "It's a long journey. It's uncomfortable. Red-eye flights are not fun. But you know what, it's worth it," Cella said. "We're all here. We're all in the same boat. We all did this." Not all the demonstrators lodged protests against Kavanaugh. Some gathered to show their support for Trump's nominee, as Caroline Simon reports for USA Today. She says about a dozen donned shirts reading "I stand with Brett" and "Women for Kavanaugh" and stood outside the office of Iowa Sen. Chuck Grassley, the Republican chairman of the Senate Judiciary Committee. Others wore red "Make America Great Again" caps and sought to counter the anti-Kavanaugh demonstrators with chants of their own. 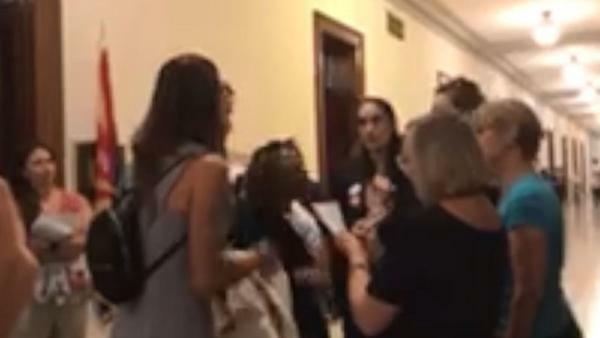 At times, the two groups of protesters, both for and against Kavanaugh's confirmation, met in the hallways for heated arguments — including this one recorded by NPR's Barbara Sprunt, which at least ended amicably enough in a high-five. 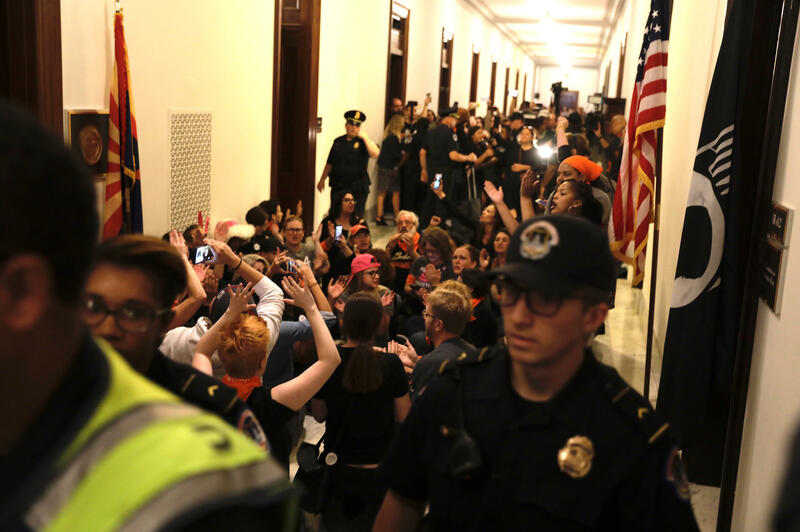 The halls of the Senate office building played host to some of the most tense eruptions of protests, though, including one outside the office of Arizona GOP Sen. Jeff Flake. Long seen as a crucial swing vote on Kavanaugh's nomination, Flake proved pivotal in obtaining the FBI investigation. But on Friday, he followed his party's leadership in voting for cloture and reportedly signaled he would vote to confirm Kavanaugh in the end. That did not sit well with protesters, who quickly massed outside his office door. Even as police officers ushered members of the media away, the demonstrators' chants of "I believe survivors" echoed down the hallway. Flake remained publicly on the fence about his final vote stance for much of Friday. 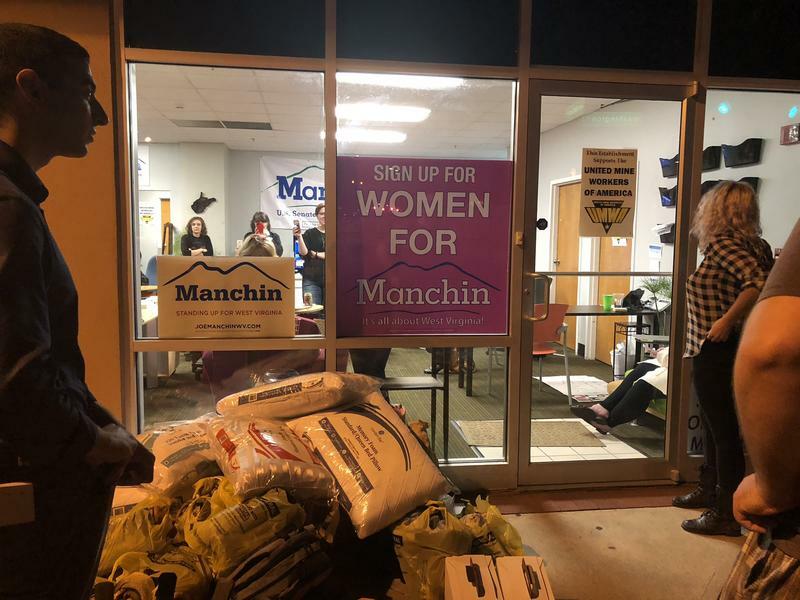 So did Collins and Manchin — and that fact was not lost on Kavanaugh's opponents, who also packed Manchin's office to persuade him to side with his fellow Democrats. Their efforts appear to have been for naught. With support from Flake, Collins and Manchin, Kavanaugh has secured the majority necessary to be confirmed to the Supreme Court. Still, the decisive move failed to extinguish the day's controversy. As Manchin addressed the media after making his announcement, protesters shouted over him in anger: "Look at us. Look at us. Look at us." 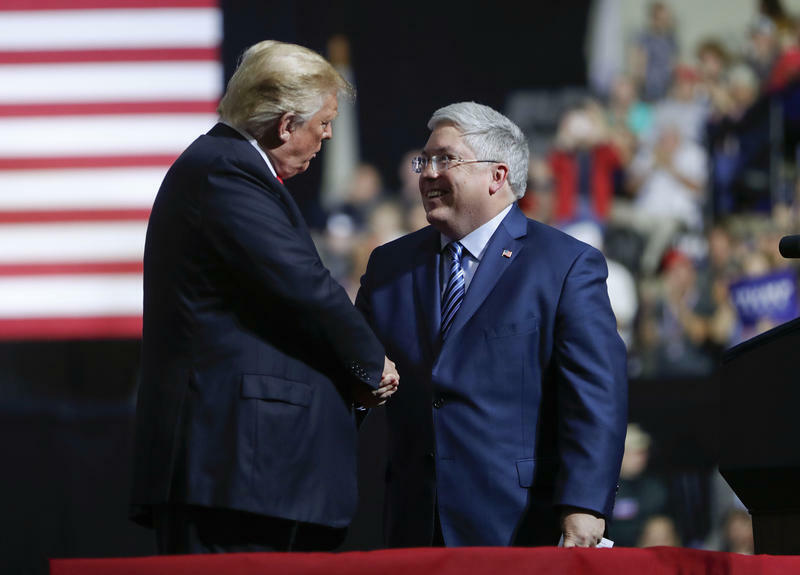 In his battle to unseat U.S. Sen. Joe Manchin, D-W.Va., Republican state Attorney General Patrick Morrisey is working hard to paint Manchin as a captive of his party even though West Virginia voters strongly back President Donald Trump. Judge Brett Kavanaugh’s Senate confirmation hearings for U.S. Supreme Court began Tuesday, Sept. 4. Kavanaugh is considerably more conservative than the justice he would replace — a fact celebrated by the anti-abortion advocacy group the Susan B. Anthony List. 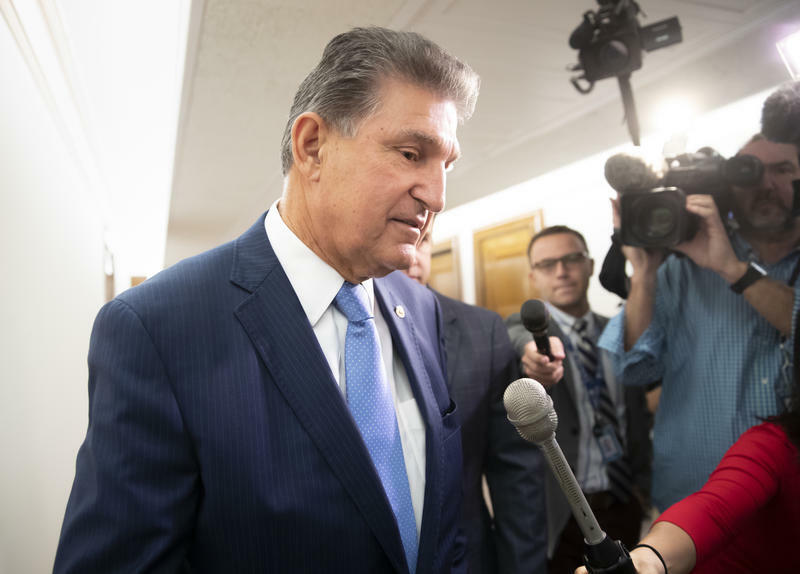 The organization has been touring several states during the past few weeks, urging democratic senators like West Virginia’s Joe Manchin to vote to confirm Kavanaugh.